Likening the EU to the USSR: not unreasonable? My answer to Brian’s letter on why 'likening the EU to the USSR' is more than unreasonable. Thank you for your sincere letter that I read with great interest. I respectfully disagree with many things you wrote and hence I need to reply openly. It will also help me to address issues that have been raised here and there by other people. I hope you do not mind. I will reply point by point and I dare hope, since we are of similar age and thus “old enough to read and comprehend history with objectivity”, that you will consider my replies the way I considered yours. By that matter, I must warn you that I also happen to have a degree in history. Let us start with 1973 when ‘your misfortune’ started with the UK joining the EEC, just a few years after Charles de Gaulle’s resignation. Back in 1973, in the USSR, there was no such thing as freedom of speech, religion, property, press or any other freedom. There was no multiparty system either, there was only one view and one ideology allowed. From a USSR point of view, the UK joining the EEC meant that the ‘imperialistic’ forces in the world gained more power. I wonder what would have happened if instead of joining the EEC, the UK had chosen to join the USSR? To my historical knowledge, your leaders quite unanimously saw some differences between the two back then. 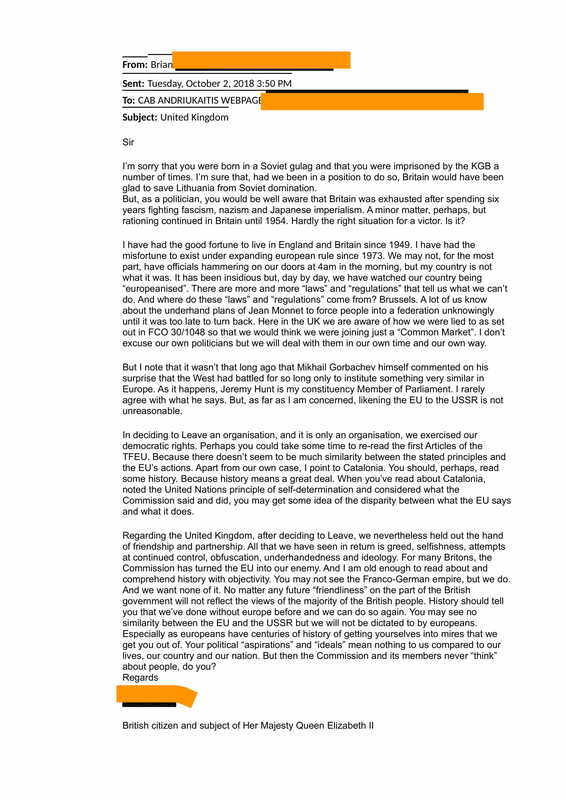 I accept your sincerity when you say that Britain would have been glad to ‘save’ the Baltic countries if only it had been in the position to do so. I do not want to sound petty and dig into the ‘dirty laundry’ but signing Yalta and Potsdam agreements did not really ‘help’. Au contraire... But that’s history. And indeed rationing of food after WWII was a rather normal thing for more than a decade in the whole Europe, the islands and the continent. For the sake of comparison, rationing in Siberia was equivalent to 140 g of bread per person per day. And nothing much to add to this precious bread. Because of such theories millions of people were imprisoned in gulags. So no, I am not a fan of any ‘secret documents’ and do not know of any ‘underhand’ plans of Jean Monet sending people to concentration and forced labour camps. You mention ‘laws and regulations’ from Brussels. Would you name a single regulation where London did not have the say since the UK joined the EU? I am eager to learn. As far as I have witnessed all of these ‘laws’ are being negotiated by the UK government and in the past, when some were regarded by London as fundamentally against the British interests, the UK has been quite successful in getting derogations.More than that, many of these same laws and regulations were actually initiated by the UK. You might know, too, that the single market was your former Prime Minister M. Thatcher’s idea. I believe it was a true British success. And respectfully, Mr. Gorbachev had said many things after his attempts to copy-paste some of the elements of the EU’ into the USSR utterly failed because copy-paste without accepting fundamental rights cannot work. All in all, dear Brian, likening the EU to the USSR is wrong and offensive. Many people who lived under Soviet regime can tell you why. One example would be that a letter such as yours, addressed by any USSR inhabitant to the government would have meant a sentence for its author - concentration camp, psychiatric clinic or, in worse case, a death row. So why and how to compare? Maybe the situation would have been different had the UK joined the USSR in 1973, had de Gaulle not resigned and continued to block the UK accession. Who knows. I don’t. What I know is that in Lithuania, we did not want to go ‘back to the USSR’, but instead chose to ‘go West’. You also mention the Treaty. I assure you that I know a lot of the articles by heart and even some very specific terms used in the Treaty such as the ‘ever closer union’ that was initially proposed by the UK conservatives. While fully respecting the referendum results I can not see how saying that ‘Britain is leaving an Organization’ supports the Catalonian case. Spain is a country, not an Organization. Or have I missed something in your reasoning? History should indeed tell us something. You say the UK has done without Europe before and can do again. Well, I believe that no country can do alone. We are all interdependent, we all need each other and facing the challenges, such as climate change, we will need each other even more. Friendship and partnership has been, is and will always be paramount. I am constantly reassured that many of your fellow citizens still count, us, Europeans, among their close friends and partners. History should indeed tell us something. You say the UK has done without Europe before and can do again. Well, I believe that no country can do alone. We are all interdependent, we all need each other and facing the challenges, such as climate change, we will need each other even more. Friendship and partnership has been, is and will always be paramount. I am constantly reassured that many of your fellow citizens still count on us, Europeans, as their close friends and partners. In partnership, both the UK and the EU would prosper. For that to happen, we better make sure that no generation, either in the EU or in Britain, believes the toxic lies of the likes of Farage's, Johnson’s, Le Pen's and others. I cared about people all my life, when I was a medical doctor, when I was the Member of Parliament, or now as Commissioner. Rest assured of that. And take care. Citizen of Lithuania, citizen of the European Union (not subject of anything or anyone). P.S. I wrote this reply to you after bumping into Reza Deghati exhibition in Buenos Aires and seeing the photo above. 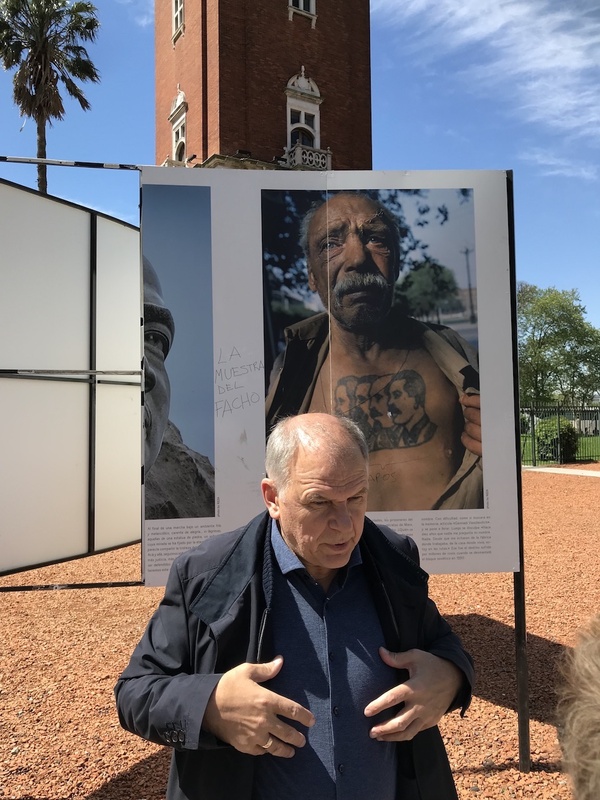 Prisoners in the gulags would tattoo faces of Marx, Engels, Lenin and Stalin in order to avoid execution as no one was allowed to shoot at a portrait of a leader. I had witnessed with my own eyes how these tattoos were done.